Hello,I’ve always developed web applictions using the ASP.Net Web Forms framework, and so far everything has been ok. A few weeks ago, though, I came up with the idea to re-engineer one of the most important web application we use at work. This web platform runs the business, has been developed using the Web Forms framework and is quite old fashioned: it’s starting to feel a little cramped when we have to add new features and new UI components that should handle complex user interactions with the UI. Not to mention that is not very usable on tablets like the iPad. Looking for a solution, I thought it would have been great to use the latest available technologies to re-engineer the system… and therefore MVC! I started learning the ASP.Net MVC framework, along with jQuery, reading the MVC Music Store tutorial . After that I decided to give it a try implementing a web application on my own, an application that lets the user query the Twitter real time feed. I had no idea where to start from, I just liked the idea of using the Twitter API! I’ll start saying that in the following tutorial there’s not much of the true MVC potential about model binding and validation, nevertheless it has been a starting point to deal with such technologies like jQuery, Json, and the foundamentals of MVC.Before we start, I want to point out that this article is not a “Get Started“ tutorial, therefore to all of you that start from scratch I strongly suggest to start reading the MVC Music Store tutorial using the link posted above, otherwise you will miss some key concepts. Furthermore, I will not post a lot of code here because it’s not really that readable, but at the end of the post you will find a link to download the source code of the project so that you will be able to follow and modify the code as you wish. The goal is to develop a web page that lets a single user (to make things simple) see Tweets related to a topic he’s interested in, as they are being created in real time. Given the single user restriction (later on I’ll explain why), this application is obviously just a toy, nevertheless it’s still useful to cover the basics and could be easily converted into something more useful. The user enters a keyword in the search bar and press the “Search” button. After a while, if someone is twitting something related to the user’ search key, tweets will appear inside a box, piling up as they are being created. When the user is satisfied, he halts the search by clicking the “Stop” button. The Twitter developer website is full of interesting and useful stuff if you want to go into more details then the one you will find here. 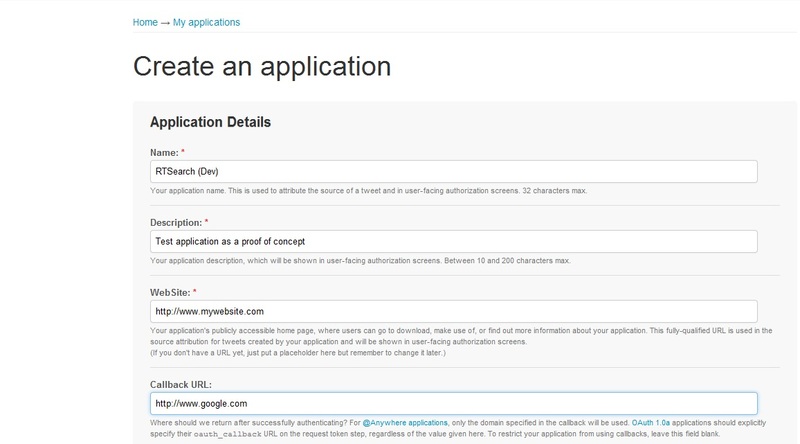 To start off we must create an application on the Twitter Developer website to start using the Twitter API. Follow the instructions on the dev website and then do as shown in the following screenshot. At the end of the process, you will receive the authorisation keys for the 0Auth authentication protocol. To handle authentication and web request processes, I’m usingTwitterizer, an ad-hoc library that can be found here. At the time I’m writing this, current version is 2.3.3, but it’s not correctly working as the address for the stream in the API is changed and is now using the HTTPS protocol. So I had to download the source code, change the address (TwitterStream.cs, row numbers 210 and 212) and import the Twitterizer.Streaming project into my own solution (I liked also the idea of looking at the code).It’s now time to decide how to architecture the project! What do you say, it’s too much architecture for such a small project? Following the code for the Tweet class. This layer is based on the Repository pattern, albeit in a very simplified form, and the repository is created by a factory, using the Abstract Factory pattern. The design is pretty easy and straightforward: the concrete repositories instances must implement the ITwitterRepository interface, therefore allowing for an easy swap amongst concrete repositories and no code change is required in the upper layers. We can retrieve either a list of tweets either a single tweet at a time, using GetRange or GetStatus methods. Both take a parameter called lastId: this is because we only want to display new tweets and not duplicates. 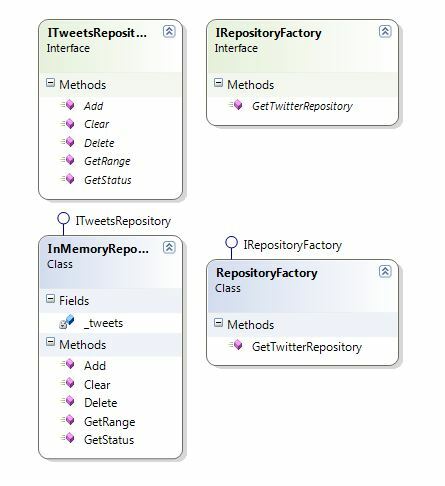 The concrete repository is created by the RepositoryFactory object, implementing the IRepositoryFactory interface. In more complex projects, and more susceptible to changes, it would probably be a good idea to use an Inversion of Control tool. For the purpose of this project I created a concrete repository that works in memory and mimics a queue, and the queue is a static object itself. Thus the single user limitation. As you can see I didn’ t put a lot of effort in this because it was not really the point where I wanted to focus on. Using a database would be a better idea, or whatever else comes to your mind. Responsible for handling user generated operations (i.e. start and stop capturing Twitter real time streaming) and subsequent automatically generated requests (more on that later). 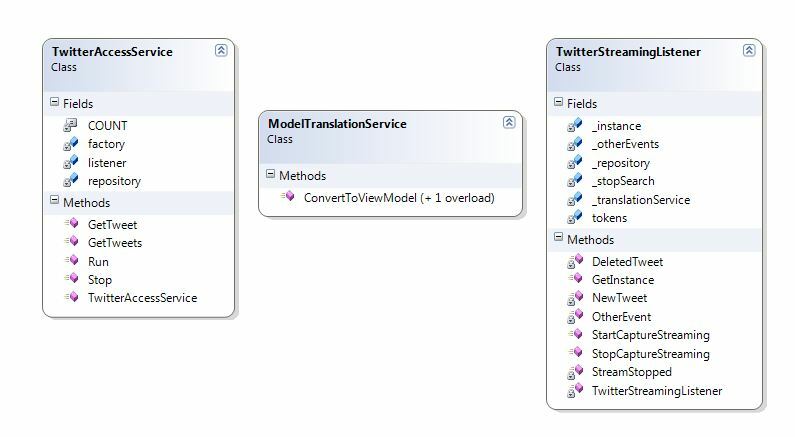 As shown in the class diagram, there are two object of particular interest, TwitterAccessService and TwitterStreamingListener. 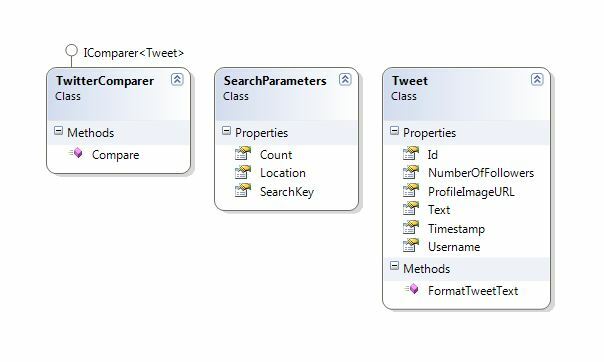 The former, as the name implies, implements the Service pattern and is the interface towards the Presentation Layer, the latter is a wrapper for the Twitterizer API. It’s designed as a Singleton (here lies the second cause for the single user limitation) and is using dependancy injection on the factory method to know which repository to use when a new Tweet or a new event arrives. The static initialization block of code is where you have to put the 0Auth tokens obtained by registering the application on the Twitter Dev site. And then we start the stream providing callbacks for main events. The repository is injected by the TwitterAccessService object, getting an instance for the repository object by the Factory.Furthermor, TwitterStreamingListener uses the ModelTranslationService object to translate from Twitterizer domain to our application domain model. These two last objects mimic the behaviour of a (minimal and incomplete) Anti Corruption layer. This application has only one page to show to the user, and all of the possible actions happens inside it. Therefore the presentation layer will be really thin and simple: 1 page and 1 controller to handle actions. As I said at the beginning of this article, there will not be much about model binding and validation, a very strong point of the MVC framework. This is because I chose to use jQuery to load new tweets at runtime. The page layout is really simple, with a search bar and two buttons to accept user inputs and a box to contain new tweets. As you can see the page is really simple and clean, with a search bar, two buttons to star and stop the search, and a tweet box to display tweets. Tweets can pile up allowing vertical scrool bar to appear. The html code is pretty straightforward, so I won’t cover it. “singleTweetMode” can be set to true to mean that we will display inside the tweets box one new tweet at a time, viceversa we will display several new tweets at a time, therefore pushing down all the old ones. “last” is used to store the Id of the last tweet that has been shown, so that tweets will be shown respecting their original timeline. Now let’s see the code in detail based on the different actions performed by the user. The HomeController will then invoke the service and then the TwitterStreamingListener object’ StartCaptureStreaming method. Type JsonResult is of type ActionResult, so the method’ signature is still valid. In the addNew function the new tweet is put on top of the list, using the “prepend” built-in function. 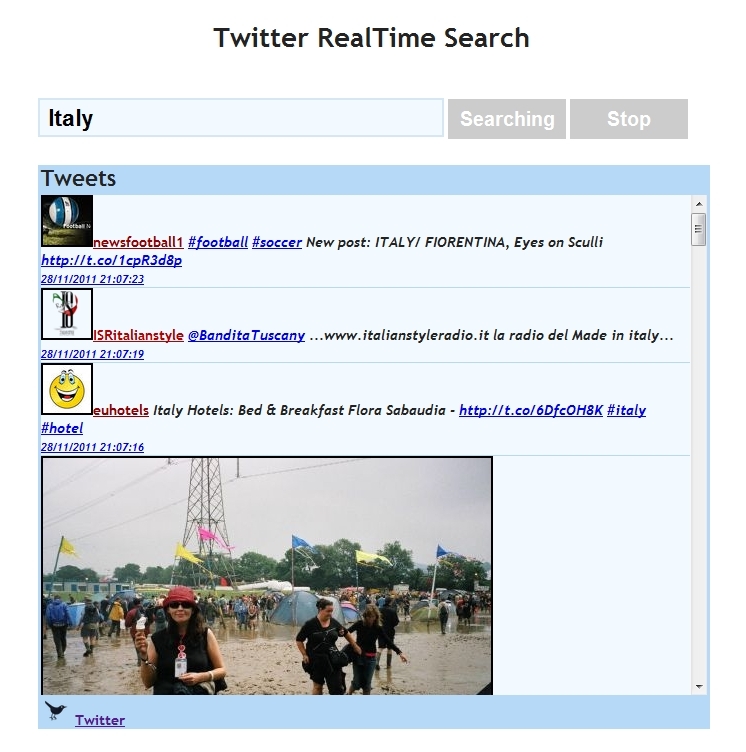 Function “renderTweet” is just a matter of building up the HTML code to display the new tweet. The username is colored based on the importance of the user, and the importance is based on the number of followers. The if statement prevents the user to perform an actual Stop operation even though no search is currently running. Then I need to perform a post to notify the Twitterizer lib to close the stream and release the resources. To make this operation easy I chose to use the Singleton pattern so that only one stream can be open at once, and therefore it’s easy to retrieve its reference. That’s it, I really hope you enjoyed this article!